Despite some volatility that the session on Monday displayed, the benchmark NIFTY50 continued to show strength and the pullback continued as the Index ended the day with a decent gain of 56.60 points or 0.55%. As of Monday’s close, the Index has pulled back nearly 300-points. Not only the validity of the support of 100-DMA has been reinforced, the Index shows potential to test the upper trend line of the intermediate channel that it has formed. While we step into trade on Tuesday, we expect the Markets to open on a quiet to modestly positive note. We expect some morning gains coming in. There is clear room for the Markets to continue its up-tick but the levels of 10360-10380 will be crucial levels to watch and the Markets may find some resistance there. For Tuesday, the levels of 10350 and 10380 will play out as immediate resistance levels. Supports come in at 10270 and 10210 zones. The Relative Strength Index – RSI on the Daily Chart 55.7629 and it continues to remain neutral against the price for today. The Daily MACD is still bearish and trading below its signal line but it is sharply narrowing its trajectory. On the Candles, once again, a Rising Window occurred. This implies continuation of the uptrend that the Markets are currently witnessing. 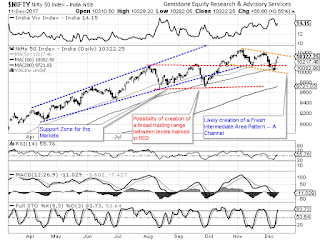 The pattern analysis clearly depicts the Markets remaining in the intermediate falling channel that it has formed. This is a falling channel, an intermediate one, created after forming highs at 10490. 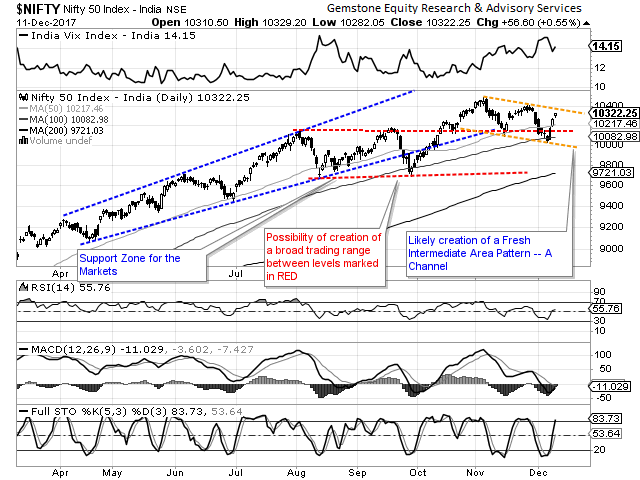 Currently, the Daily RSI is still seen making lower highs and it is yet to breach out of a formation. Until this happens, we can expect the Markets to face resistance at higher levels. Going by the overall structure of the Charts, we might see some more up move coming in. We expect the pullback to continue but in the same breath, we also expect the Markets to face resistance around 10360-10380 levels. If the Markets face resistance around these levels, then the current falling channel on the Daily Chart which has emerged as an intermediate trend will remain valid. It would be crucial to see Markets going beyond these levels. We continue to recommend remaining highly stock specific. Picking right stocks and protecting profits at higher levels will remain crucial as we face Markets in coming days.